Cake Pops - Everything you love about Cake Balls...on a stick! We are selling cake pops (almost) faster than we can make them! And who can blame our customers for loving cake pops so much? It's everything you love about cake balls made portable and easy to eat on a stick! 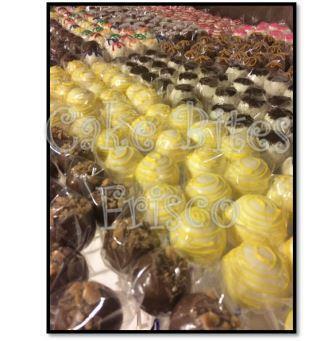 Our cake pops come individually wrapped making them perfect to serve at any event or to send home with guests as favors. Check out all of our delicious flavors at http://www.cakebites.biz/menu/. We even ship our cake pops nationwide so you can send some cake pop love to your friends and family all over the United States. Order today at http://www.cakebites.biz/.